The art of loving yourself madly can start with a 5-minute exercise each morning. I challenge you to do it for a month and see the results that you get. It’s unbelievable the power of your mind. I’ve been talking about self-appreciation in my last three blogs. This is because it's truly the basis for all other good things to flow into your life. That relationship you've been dreaming of (either the one you don’t yet have or the better one you wish to create with your current partner), abundance in time and money, work that you love doing and you're not scared to go for and do to your fullest courageousness. Etcetera etcetera. As a woman in my tribe, you know I work with you on syndromes such as busyaholicness, perfectionism, over-achieving and over-functioning type behaviors. When we get into these habits because of earlier programming, then we've usually developed a very negative inner critic. Usually, my clients think that they can beat themselves up to success of any kind — achieving at work, being the perfect partner, losing weight, drinking less or any other goal you have. But have you ever seen someone hate themselves to success? If you have, trust me it’s not sustainable and not what you want to continue doing. Even when you achieve what you want it feels empty and dull and usually you're pretty exhausted at that point. Also, what you attract into your life is usually HARD like the whip you have been using on yourself, instead of gentle and flowing. I help you retrain your brain to be more confident and accepting. Only from this place is where true success and fulfillment actually comes. This is one of the tools I use to get you starting to think, feel and act very differently and get the results you truly want and deserve. Remember anything that we do is because of how we think it will make you think it will make you feel. So make it count. Do it out of love. I want you to have yet another skill to help you reprogram your mind to be loving, kind and appreciative of yourself. It’s called a Positive Thought Download. I want you to do this every morning when you wake up for at least a month, but for however long it takes to reprogram your brain into some serious self-love. A thought download is just a mind dump. You write down everything that's in your mind — all the thoughts and feelings you are having. However, this thought download is specifically going to be about all the things you appreciate about yourself, what you love about you, observing and reminding yourself of your unique talents and qualities, how you will through this particular day from a place of self-appreciation, from a place where not beating yourself-up is non-negotiable. You write as if you were already in a place of complete acceptance. What would be going on in that beautiful mind of yours? How would your life look? What would you be thinking and feeling? What decisions would you be making (big picture and little)? What would your day look like from start to finish? What do you appreciate and love about yourself? How can you be your own best friend today? What special gifts and talents do you have? How can you take the best care of yourself today? Ask yourself what is the most loving thing to do for me in every situation? 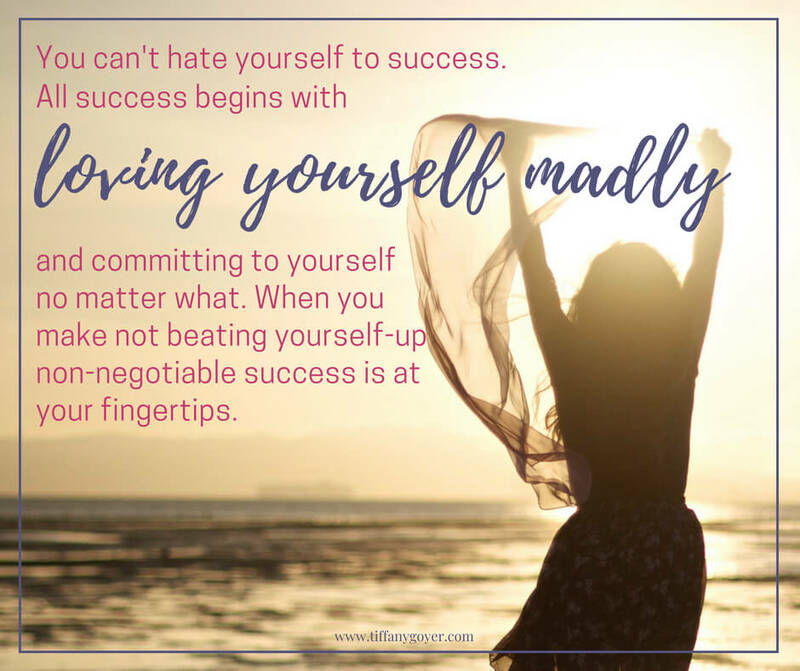 Can you see how exciting it will be to love yourself madly? Go to it now and let me know how it changes your life, because it will.